I am an avid reader. Nancy Drew hooked me in and I’ve never lost the thrill of a great story. There’s just something about the weight of a book in my hand, the feel of good paper and the musty smell that I’ve always loved. I often have two books going at once and sometimes a third on my kindle. Fiction, non-fiction and something on personal growth. A great deal of my hard earned money has been spent on books. These days I buy used from Powell’s Books and sell them back. And, as part of our simpler lifestyle, I’m re-kindling my romance with the library. Why did I stay away so long? There is nothing better than sharing a great read or an inspiring book with friends. I’ve never belonged to a book club, but it’s on my bucket list. I hear they are often a front for great conversation and good wine. If so, somebody please invite me. I’ll come. A few weeks ago I joined a really cool online network of book lovers called Goodreads. It’s a great place to see who’s reading what and get unbiased reviews. I got so excited that I signed up for the 2013 Reading Challenge and committed to read 50 books this year. 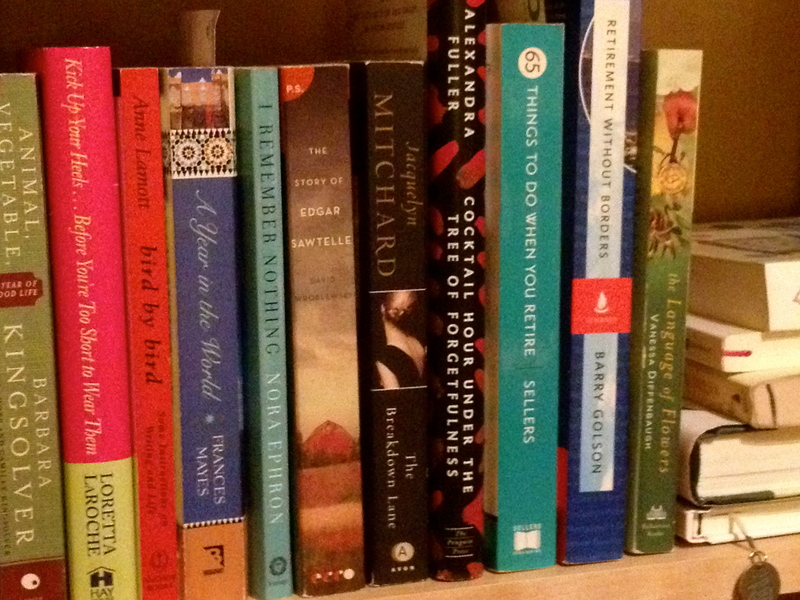 Making a 50 book reading list is a wee bit daunting – So many books. So little time. Or something like that. I need help! So, inquiring minds (mine) want to know… What’s on your nightstand? 1. What are you reading right now? Do you love it? 2. What is your all time favorite book? Right now, I’m reading tiny beautiful things ~ advice on love and life from Dear Sugar. It’s good writing in an unusual format and I am enjoying it. On my Kindle: On Writing Well by William Zinsser. First published over 30 years ago, it is the go-to guide for aspiring non-fiction writers. Here’s what I’ve learned so far – If you can say it with fewer words, do! My all time favorite book? Not such an easy question to answer because, truth be told, I’ve read a lot of books in the crap fiction genre and also, I have the darn short term memory problem. I read them, love them, and then, like a hummingbird full of juicy nectar, I move on. A recent favorite is Wild by Cheryl Strayed. It’s a great read from cover to cover. 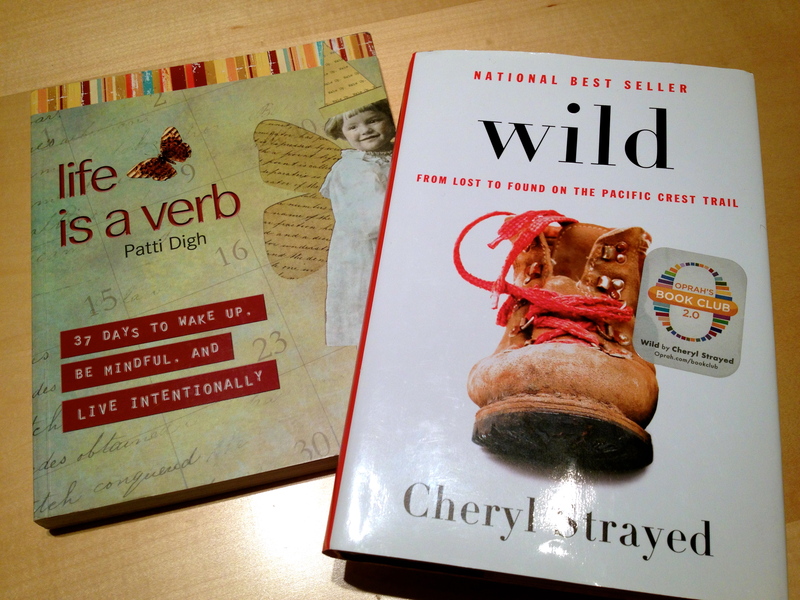 Life is a Verb by Patti Digh is a fantastic book that I go to for inspiration on living life fully and with intention. I have read it every January for the past three years. I love how her mind works and how she writes. Good stuff. Oh, and anything by Barbara Kingsolver. Now folks, it’s your turn. What books should I add to my Goodreads Fifty Books List? Please leave a Comment with your favs and recommendations. I’ll put them on my list and share in another post. This entry was posted in Favorite Things, My Musings, Simple Pleasures and tagged Amazon Kindle, Book, book clubs, boomer women, building community, Cheryl Strayed, favorite books, Goodreads, Reading, William Zinsser, women's inspiration by justabackpackandarollie. Bookmark the permalink. “Oulander” by D. Galbadon and “Shadow of the Wind” by Carlos Ruiz and “Walk Across the Sun” by Corban Addison are all good books that I think that you would like. Check out my books on Goodreads. I have a lot of sci-fi and romance too. Not sure if you are a fan of those. Thanks Heather! I’ll put these on the list. I don’t usually read sci-fi, but since I’m trying new things, I’ll look at your goodreads books and pick one to read as well. I just read The White Tiger and The God of Small Things. Both excellent. Really want to read Wild! Thanks for the recommendations Regina. I will certainly add these to my reading list. I’ve not heard of either book, but I already love the titles. You do need to read Wild. You will relate to her story and she is brave and brilliant in her writing. Enjoy. Two votes! I guess I’ll have to read Outlander for sure. So, after reading today’s blog, I went to GoodReads (which I had already joined but didn’t realize it) and spent a lot of time adding books I wanted to read and rating books I’d already read. I probably could have read 50 or more pages of the book I’m reading – and I’m not done rating the books – ha! I thought I was the only woman left in Portland who hasn’t been in a book group – good to know we’re both un-grouped and that a group may be in our future. I’m also reading several books at once these days – no Kindle yet, but I’ve discovered audio books and ebooks to download from the library. I can listen and read on my Android – which has opened up a whole new world of listening to books while working out at the gym. I loved Wild and am on the waiting list for Little tiny Things from the library. I love the on-hold system – and the library in general. Love the heft of a library book, rather than a little paperback. I’ve also started shedding books in my letting go and paring down – so unless it’s something I know I’ll refer back to – I’m no longer buying books. I’ve recently read Swimming by Hershon, Food Rules by Michael Palin, About Food by Mark Bittman, When Women were Birds by Terry Tempest Williams. I’m now slogging my way through The Greater Journey about Americans In Paris by David McCullough. It’s interesting reading but quite slow for me (my husband devours books like this). A couple more I just thought of: The Immortal Life of Henrietta Lackes, The Ladies #1 Detective Agency and Abundance: It’s not as bad as you think. Wow! Thank You for all of the great reading inspiration. Some I’ve read but lots to add to the list. McCullough is slow to me as well. I might pass for now on that one. I’ll look up your recommendations on Goodreads as well. This is so much fun! All-time favorite? Tie between Catcher in the Rye and On the Road. Great titles. Thanks for sharing your favs! I also just read J.K Rowlings The Casual Vacancy over the holidays …. hated it. I’m going to have to double check my Goodreads account too ! I’m not sure if I have a favourite book. I know I love historical fictions. Hi Astra, Thanks for the recommendation and the warning. It’s been 30+ years since i read Gatsby. I loved that book. It’s on the list! thank you.